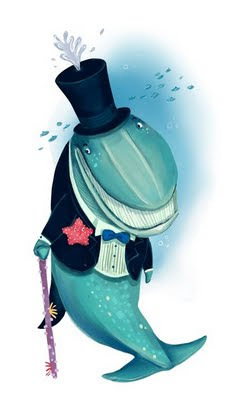 a little bit bunny: Balaenoptera musculus...steppin out! The anemone stick, the star fish button hole, QUITE the snazzy cetacean! Love the little touches and the BIG grin. Oh, and we won't mention the interspecies shenanigans... these upperclass toffs and their depraved lifestyles ;-) Superb work... oh, & don't forget to choose next months creature and change the box on the blog. Privilege of being first to post this month! Lovely blue whale Froggie. The largest gentleman ever to have lived. Love the hat/blow hole detail.